BWC was incorporated in June 1982, by Robert Slater, Patrick Collins and Jack Andrews; "To acquire, construct, own, operate and maintain a central water supply and distribution system..."
moratorium to maintain system pressure and supply. Months of hard work laying the groundwork for BWC, by Bob Slater and others, were followed by more months of incredible red tape and tedious paperwork and mailings. Volunteers filled out forms, made phone calls, discussed and planned. They were able to secure a loan from Farmer's Home Adminstration after being turned down by two banks, (which was a loan requirement). BWC purchased the existing system from Mr. Gerard via a generous interest-free loan and fair price. 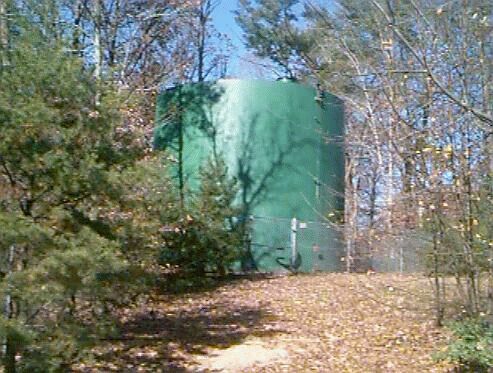 "Storage Tank at The Robert Slater Plant"